Reach new customers with SEO"
Every website needs to be optimized for search engines in order for people to find you through search engines. What does this mean to you? Your website must be well formated and well formed. All your meta-data must be filled out correctly. And it must be unique to each page. Each webpage must be relevant to the product or service you are trying to offer on that page. And each page must offer your customers a good "user experience". Is your website search engine friendly? Schedule an appointment with one of our online consultants and let us help you drive your business into the next century. In this section, we will talk about relevancy search engine listings and how we can help your business. Relevancy search engines is just a fancy term for the things you use every day, Google, Bing, Yahoo - search engines. Whatever search engine you use to find information, products or services on the web. They are called relevancy search engines because when you do a search, they tried to give you the most relevant web pages to the search term or phrase that you used. Like 'restaurants'. It is a very generic search term and you may get millions of results from a search engine. But let's say you want to find 'fine dining restaurants', and you want them to be in Oklahoma City. Then the search engine will give the websites that are the most relevant to your search phrase: 'fine dining restaurants in oklahoma city'. If your website has been optimized well, and on your homepage you have something like: "Welcome to the Village Steakhouse: the best fine dining restaurant in Oklahoma City" and you have those words in the title of your meta tags, and a brief description that describes you as a fine dining restaurant in oklahoma city, your website will be extremely relevant to that search and have a very good chance of showing up on one of the first few pages. Give us a call: (405)-254-3767. Utilize search engine paid advertising to increase greater return, exposure, brand awareness, acquire new customers. 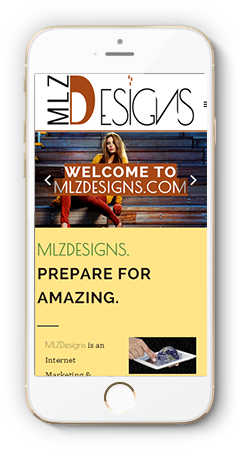 At MLZDesigns, our total objective is to help you achieve your online marketing goals. Goals that yield higher results and fit your budget.